Cell cycle events are regulated by the sequential activation and deactivation of cyclin dependent kinases (Cdks) and by proteolysis of cyclins. Chk1 and Chk2 are involved in these processes as regulators of Cdks. Chk1 and Chk2 both function as essential components in the G2 DNA damage checkpoint by phosphorylating Cdc25C in response to DNA damage. Phosphorylation inhibits Cdc25C activity, thereby blocking mitosis. Cdc25A, Cdc25B and Cdc25C protein tyrosine phosphatases function as mitotic activators by dephosphorylating Cdc2 p34 on regulatory tyrosine residues. It has also been shown that Chk1 can phosphorylate Wee1 in vitro, providing evidence that the hyper-phosphorylated form of Wee1, seen in cells delayed by Chk1 over-expression, is due to phosphorylation by Chk1. 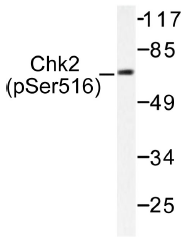 Chk1 is phosphorylated on Serine 345 (S345) in response to UV, IR and hydroxyurea (HU). Chk1 plays an essential role in the mammalian DNA damage checkpoint, embryonic development and tumor suppression. Phosphate buffered saline (PBS) with 0.05% sodium azide, approx. 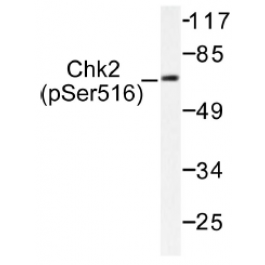 pH 7.2.
p-Chk2 (pSer516) antibody detects endogenous levels of p-Chk2 protein.